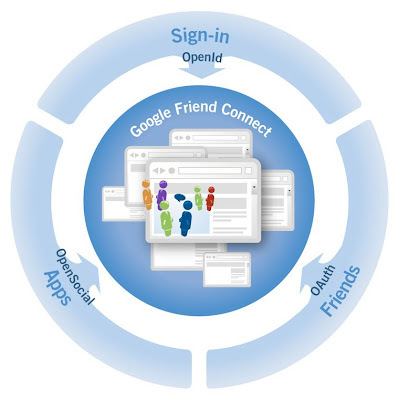 With barely days after Myspace and Facebook announced their plans to make their profile data portable to other platforms Google announced its plan to launch Google Friend Connect. So you an interact socially from website whose owner has enabled Friend Connect. According to Google the owner can add a code snippet to their website and can interact with the friends on various social networks like facebook, g talk, orkut, hi5 and also interact using various open community apps like ilike and so. * Drive traffic: people who discover interesting sites can bring their friends with them, and can opt-in to publish their activities on those sites back into their social network, attracting even more visitors. * Increase engagement: access to friends and OpenSocial applications provides more interesting content and richer social experiences. * Less work: any site can have social components without hiring a programming team or becoming a social network. So how and to what extent is it going to be useful is to be seen when it launches formally. I think initially they would be selecting only blogs with large traffic so that it is tested in a better way.